What does the African spurred tortoise look like? The African spurred tortoise is the largest tortoise on the African continent and the third largest in the world. This tortoise, which mostly dwells in the desert, is camouflaged very well by its whole sandy coloring, having impenetrable golden to yellow-brown skin and a brownish shell. It has a wide, oval shell which shows noticeable grooves at the front and back brims and eye-catching growth rings on every scute which become marked especially with age. Large coinciding scales conceal the anterior surface of the forelimbs, whereas the posterior surface of the thigh allows for two or three huge conical spurs, from which this tortoise got its name. Where is the African Spurred Tortoise found? This tortoise lives in hot, arid areas ranging from desert suburbs to dry plains, where there is lack of permanent water supply. It is found along the southern border of the Sahara, from Senegal and Mauritania, east through Mali, Chad, Sudan and Ethiopia all the way to Eritrea. This species of tortoise might also be found in Niger and Somalia. What food does it eat? These tortoises are Herbivores. Their diet consists of many different types of plans, including grasses. Generally their meals are high in fiber and low in protein (i.e. not meat eaters). If they consume too much protein it can affect their development causing a pyramid like shape in their shell. Fruits are another food that should be avoided. Some examples of foods good for them are carrot peelings, hibiscus plants and rose flowers. Tortoise food bought from the store is also another alternative though it is not recommended for some spurred tortoises due to preservatives. Just be weary of what you feed to your pet tortoise. 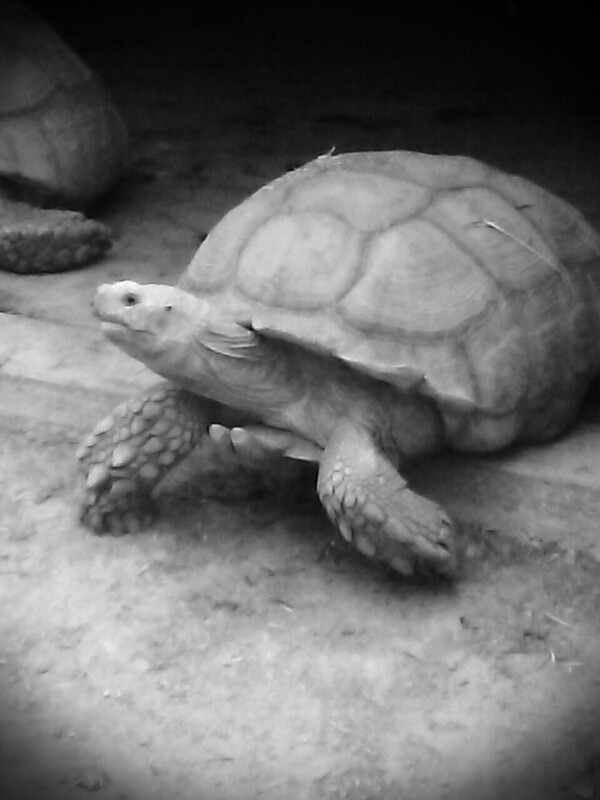 This species of tortoise can breed from June through March, however reports seem to show that it often take place after the rainy season during September through to November. Four or five nests may be burrowed before the female chooses the one in which to lay her clutch of about 15 to 30 eggs. As soon as they are put down, the eggs mature underground in the roofed nest for about eight months. These tortoises grow quickly and become very large. These tortoises are very hostile towards each other, and particularly during breeding periods. The males in particular can usually be seen butting into its fellow males and trying to flip each other over. They have a tendency to become obese if overfed, thus every African Spurred tortoise owner should ensure that its food is served in moderation. These young creatures are killed from time to time by dogs, cats, opossums and raccoons. Many ethnic groups in the Sahel, particularly the nomads also hunt them for food. The already defenceless position of the species has recently been compounded by a rise in capture for worldwide trade, as pets and for body parts reportedly used to make long life medicines in Japan. Is the African Spurred Tortoise endangered? The African Spurred Tortoise is an endangered species. Loss of habitat and illicit hunting are their main causes. Several people purchase the young tortoises in order to keep them as pets but soon get bored of them because of the great amount of care they require. Please don’t be one of these people if you choose to be an owner.